There was excitement in the air at this year’s Faculty/Staff Annual Fund Campaign Luncheon held February 2 in the Peabody Library. Volunteers celebrated reaching their goal of 80 percent participation rate in this year’s campaign. 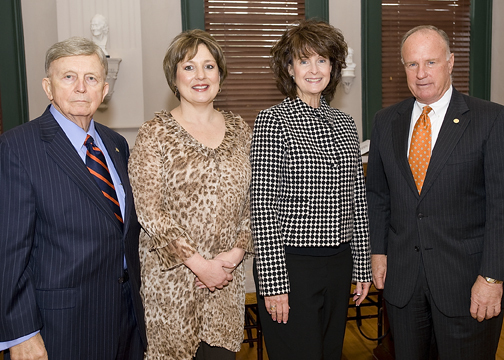 SHSU President Jim Gaertner praised the university’s participation rate. “This past fall during the campaign, the faculty and staff giving reached a 80 percent participation rate with 1,313 donors giving or pledging $217,000,” Gaertner said. 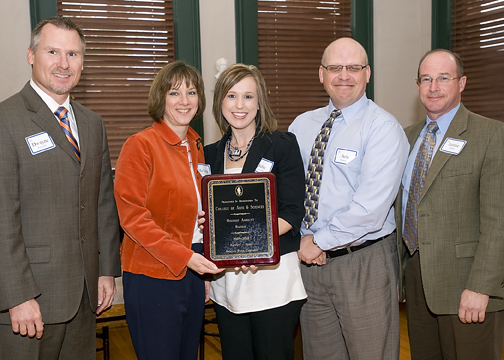 During the luncheon, awards were presented to university divisions. Jim Bexley, campaign general chairman, along with Sherry Henke, campaign staff chair, and Rosanne Keathley, campaign faculty chair, handed out the awards. Bexley also encouraged contributions from faculty and staff for FY2009-2010 to continue through Aug. 31. Units with 100 percent participation included Newton Gresham Library, Student Services, the President's Office, the College of Education, and University Advancement. The unit with the highest percent increase of amount raised, going from $11,000 to $26,000 this year with an increase of 142 percent, was the College of Criminal Justice. 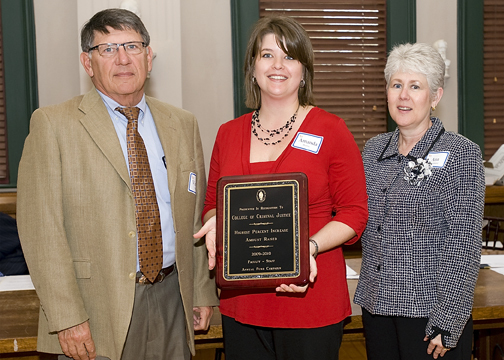 The College of Arts and Sciences was recognized as the division with the most dollars raised — $52,000. The College of Arts and Sciences campaign committee was chaired by Dwayne Pavelock with members Sibyl Bucheli, Becky Finley, Barry Friedman, Lisa Garrett, Melinda Holt, Karon Murff, Andy Noble, Aric Schneller, Julie Schwab, Jessica Stas, John Strait, and Rick White. Bill Green chaired the College of Business Administration committee with members Joe Kavanaugh, Anna Shaheen, Carol Shaw and Laura Sullivan. The College of Criminal Justice committee was chaired by Amanda Burris with members Ann Broussard, Doug Dretke, Nancy Durham and Janet Mullings. The College of Education committee was chaired by Sherry Hirsch with members Debbie Allen, Randi Clower, Susan Hayes, Teresa Hughes, Fred Lunenburg, Nancy Votteler, Matt Wagner, and Ryan Zapalac. The College of Humanities and Social Sciences committee was chaired by Terry Thibodeaux and included members Debra Andrist, Rosanne Barker, Tracy Bilsing, Gustie Callaway, Donna Desforges, Brenda Lowery, Lee Miller and Janis White. The Enrollment Management committee was chaired by Kerry Berry with members Susan Byrd, Nancy Holcomb, and Valerie Sparkman. The Finance and Operations committee was chaired by Glenn Green with members Melissa Asbury, Cynthia Bennett, Debbie Birdwell, Cari Box, Sheila Cannon, Bob Chapa, Kevin Morris, and Noelle Thompson. The President's Office committee was chaired by Kathy Gilcrease with member David Paitson. The Student Services committee was chaired by Leah Mulligan with members Cindy Allbright and Kari Zella. Campaign coordinator Cindy Truax, who is the SHSU director of annual giving, was pleased with the outcome, as well. “We have a wonderful group of people that work on the committee encouraging others within their departments to give back to the university. I would like to give special thanks to Jim Bexley, Rosanne Keathley, and Sherry Henke for their continued leadership.” she said. The Newton Gresham Library had 100 percent participation. 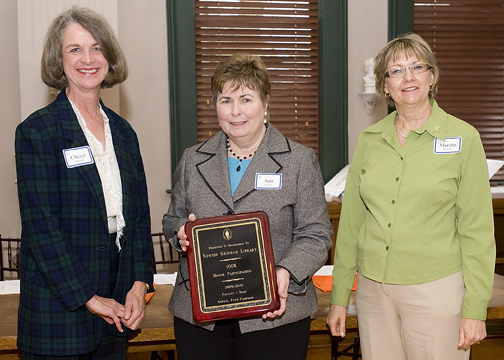 From left, Cheryl Spencer, Ann Holder and Marsha Dickens. Student Services had 100 percent staff participation. 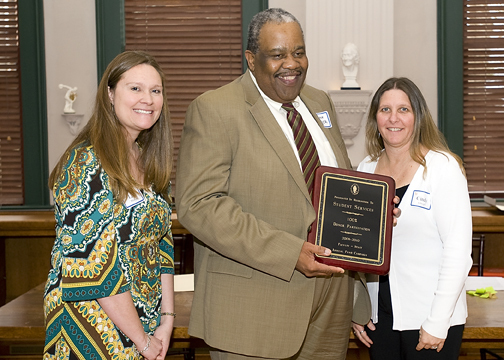 Representing the division were, from left, Leah Mulligan, Frank Parker and Cindy Allbright. The President's Office had 100 percent participation. 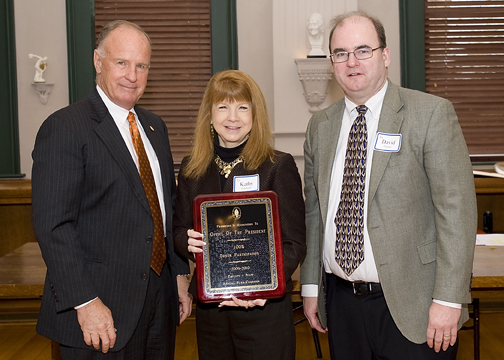 From left, Jim Gaertner, Kathy Gilcrease and David Paitson. University Advancement had 100 percent participation. 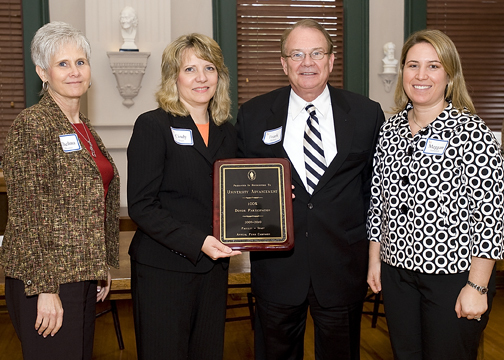 From left, Thelma Mooney, Cindy Truax, Frank Holmes and Meggan Thompson. The College of Education had 100 percent participation. 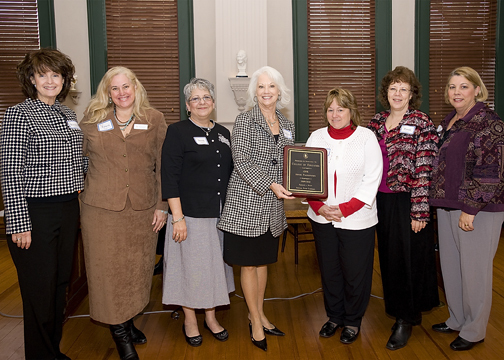 Representatives included, from left, Rosanne Keathley, Teresa Hughes, Susan Hayes, Genevieve Brown, Sherry Hirsh, Randi Clower and Nancy Votteler. Criminal Justice had the highest percent increase of amount raised. From left, Vincent Webb, Amanda Burris and Ann Broussard. The College of Arts and Sciences raised the most dollars during the campaign. From left, Dwayne Pavelock, Melinda Holt, Julie Schwab, Aric Schneller and Jaimie Hebert.